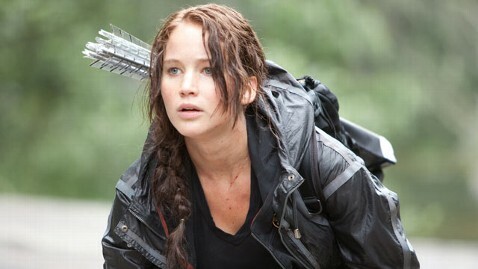 Psychologists are calling the criticism that Jennifer Lawrence appeared too heavy in "The Hunger Games" "toxic" and "dangerous" for the film and the book franchise's many teenage fans. Multiple media outlets made mention of Lawrence's figure in their coverage of the box office phenomenon. The New York Times wrote, "A few years ago Ms. Lawrence might have looked hungry enough to play Katniss, but now, at 21, her seductive, womanly figure makes a bad fit for a dystopian fantasy about a people starved into submission." The Hollywood Reporter cited Lawrence's "lingering baby fat." "These kind of messages are toxic," Kelly Brownell, a professor of psychology at Yale University, told ABCNews.com. "They pressure people, especially girls, to be at odds with their bodies and to fight against whatever natural weight they might have. They force into the public psyche an arbitrary and unrealistic ideal that is attainable by few and leaves a great many scars in its wake." In the film, Lawrence hunts, runs, tackles, climbs and shoots arrows with accuracy that makes Robin Hood look like a hack, all of which demands physical fitness, not a waif-like figure. "Having a strong woman character is always a positive," said Carol Bernstein, an associate professor of psychiatry at the NYU School of Medicine, "and it's unfortunate that the discussion has been sidetracked. It's very upsetting that the media puts so much focus on these kind of things, which makes young girls who are very susceptible to eating disorders think twice about how they look." Lawrence was aware of these issues long before she arrived in Hollywood. "I remember when I was 13 and it was cool to pretend to have an eating disorder because there were rumors that Lindsay Lohan and Nicole Richie were anorexic," she said in a recent interview with Seventeen magazine. "I thought it was crazy. I went home and told my mom, 'Nobody's eating bread-I just had to finish everyone's burgers.'" She added, "I'm just so sick of these young girls with diets. I think it's really important for girls to have people to look up to and to feel good about themselves." Given her attitude, she might be just what those young girls are looking for.